Hello readers of U-Create! 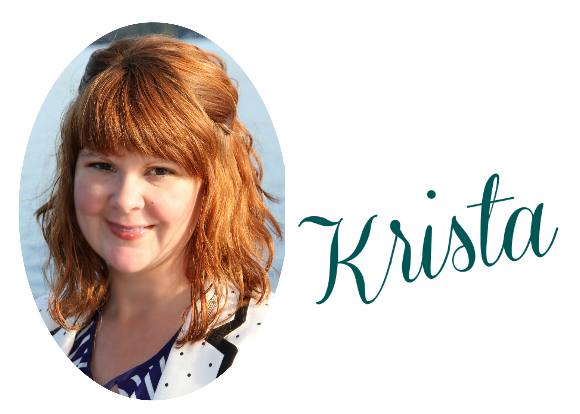 I’m Krista from The Happy Housie and I am so excited to be here today sharing a simple sewing project for making your own Envelope Style Lumbar Pillows. 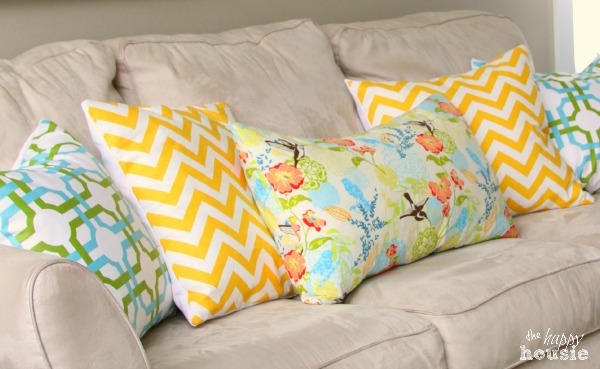 These are the perfect shape for using as a featuring pillow on a bed, or even on your sofa. 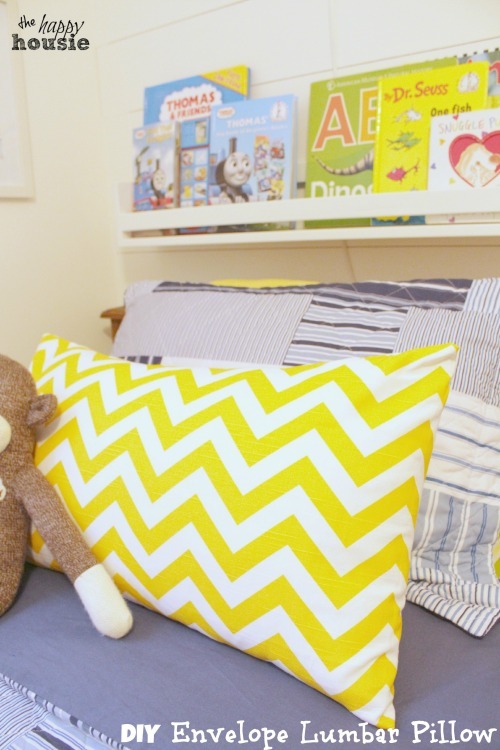 The pillow I am sharing today was made for my son’s twin bed as part of an ongoing bedroom revamp for our boys’ bedroom. I am beyond thrilled to be here at U-Create today sharing this project. As I said, I spend most of my bloggy time over at The Happy Housie . 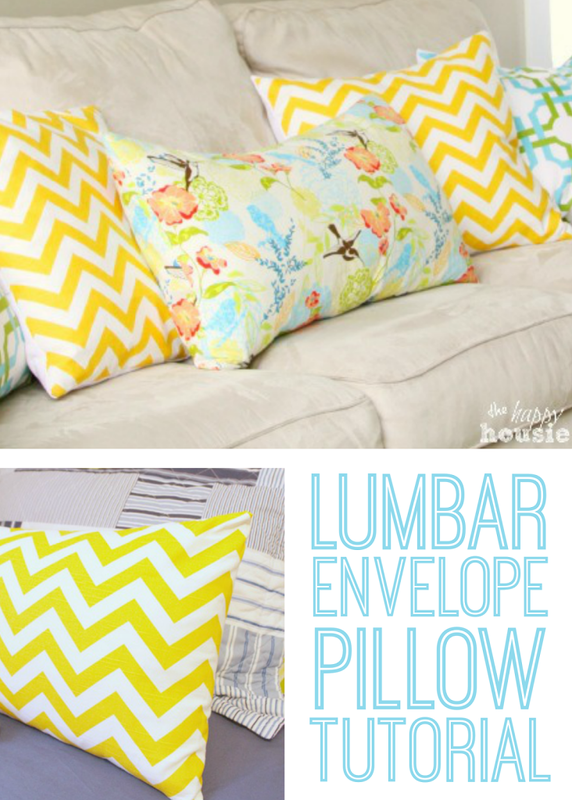 I called my blog this because I think of myself as a “housie”; someone whose hobby and passion is all kinds of house related stuff like decorating, crafting, organizing, and DIY projects… like these easy DIY Envelope Pillows. The trickiest part is figuring out the size that your fabric should be. First measure your pillow form. 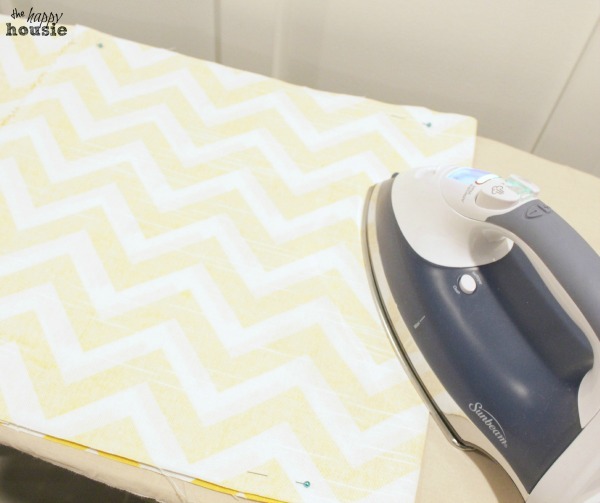 Mine was 14″ x 24″ so I cut my fabric to 15″ x 56″. 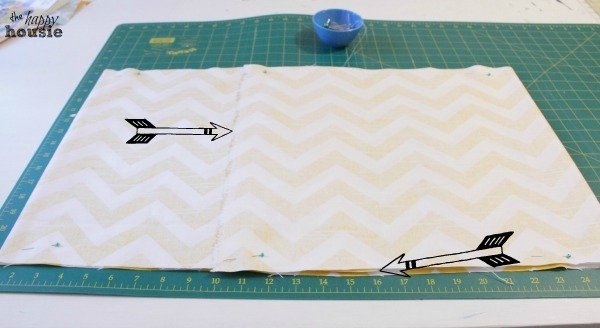 You want to add about 1/2 inch for the seams along the non-envelope part and you add about 8″ for the overlap for the back. Choosing your fabric size also depends on how full the form is you are using. For a full discussion of this, see my other envelope pillow tutorials here and here. 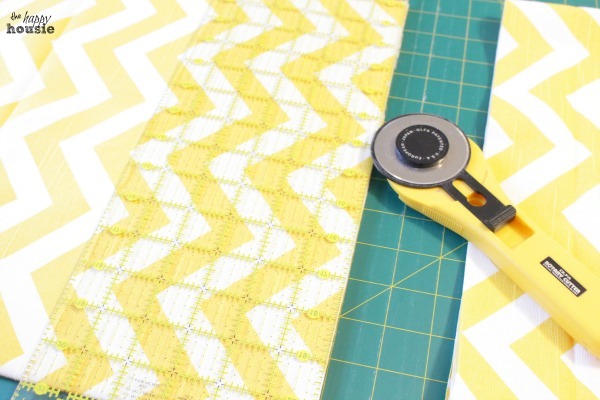 I used my rotary mat and cutter to help me slice up my fabric but you can just as easily measure it with your measuring tape, use a straight edge or ruler to mark it lightly on the back and cut it with some sewing scissors. 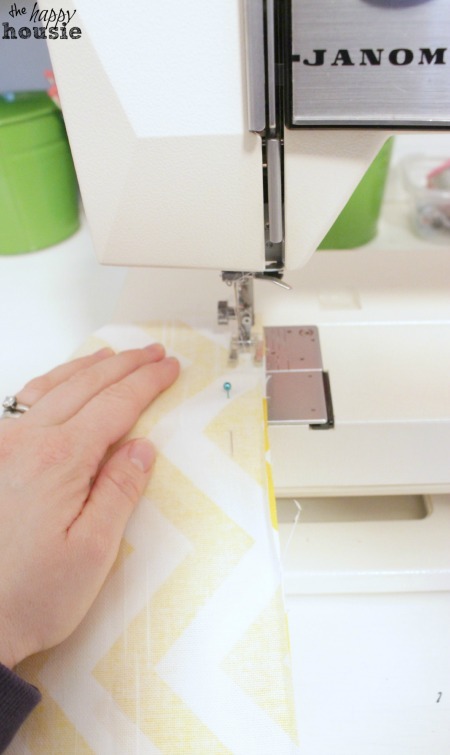 Next, you may wish to take the ends and iron a hem and run it through your sewing machine so that you will have nice clean edges on the back of your envelope pillow where the fabric overlaps.. 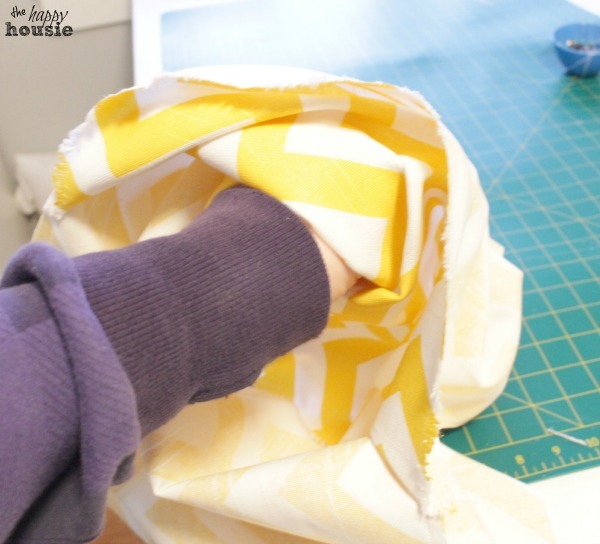 I actually skipped this step and just used the rough sewn edge that the fabric came with as it was a 56″ width of fabric. Once my piece of fabric was cut (and you have hemmed the two edges if you are doing so) lay the fabric out the right side (or pretty patterned side) facing IN on itself. I measured to make sure it was the dimensions I wanted (15″ x 56″) and then pinned it lightly. And stuffed the pillow form inside of it. 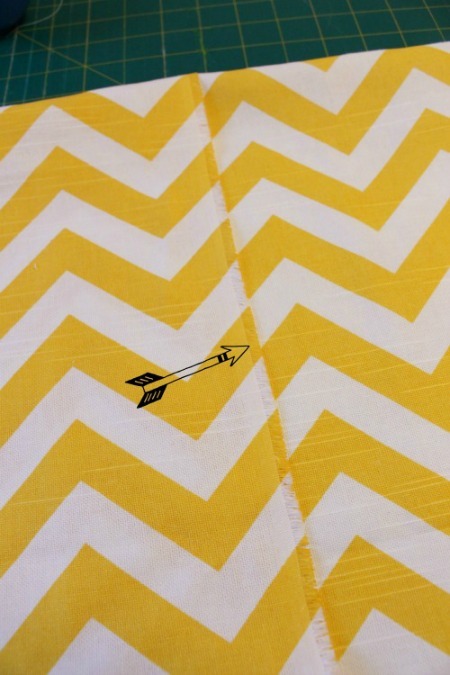 And over at The Happy Housie I have a couple of tutorials for one-piece envelope pillows (using one piece of fabric, like this tutorial did) as well as two-piece envelope pillows (using a different backing fabric as you see in the yellow chevron pillows above). 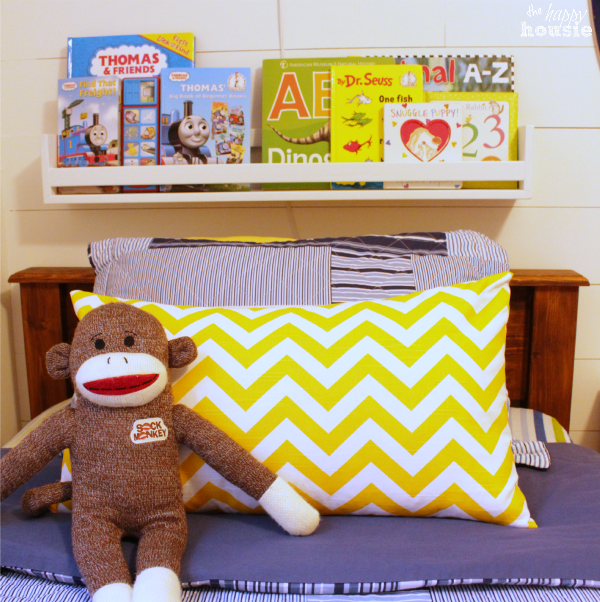 I also have been sharing a few more fun projects for my boys’ bedroom revamp! I would love for you to hop over and check them out! Thanks for reading. And remember, my housie friends, HOME isn’t built in a day. Enjoy the journey. wow! that is seriously AWESOME! 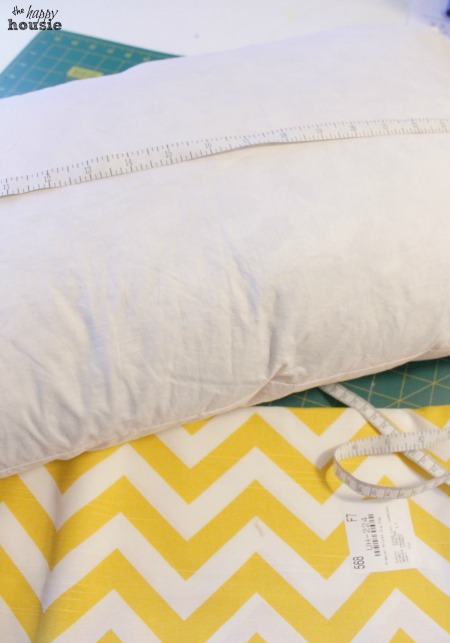 I just made two pillows using your method, and it was so easy and fast! I probably had more overlap than I needed, so will modify my notes for next time, but they’re beautiful and “non-threatening” to make. Thank you for posting this!